Eleven years ago I set up my Virtual Assistant company and I have grown it mainly by marketing the business through networking. Today I still append 18.5% of my time networking and 67% of my business can be tracked directly back to networking referrals. So how does it all work? Secondly you have to be clear with your networking contacts as to the type of work you do and the sort of contacts you require, the “1-2-1 Toolkit” can really help here. I recently met with a gentleman who told me he had no business in 5 years of networking. My first thought was why do you keep doing something that brings you no results? The interesting thing was he then told me how he had managed to secure a great contract with a large business, what he had forgotten was that I introduced him to the business in the first place. Where did he meet me? Through networking! They have subsequently referred him to another client, would he have managed to get that referral if I had not made the original introduction? That has also come on the back of his networking – and so it goes on. 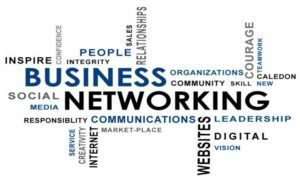 Networking can be a very powerful tool, it does need to be worked at – but do keep track of everything.